CAIRO – 25 April 2018: After the Antiquities Ministry announced moving more than 55 mosque pulpits from their current places inside Egypt's ancient mosques to the National Museum of Egyptian Civilization, a lot of controversy was stirred,especially since the announcement came following several complains about robberies at some mosques. Earlier this month, parts of the copper pulpit belonging to Abu Bakr Mazhar Mosque were reported to be stolen. The incident was announced to be investigated by the government; however, days later, the Antiquities Ministry announced moving 55 pulpits, which raised a lot of questions about the safety of ancient mosques. Protecting Egypt's ancient Islamic mosques is considered to be the Ministry of Awqaf's (Religious Endowments) responsibility, which raises part of the controversy regarding the Ministry of Antiquities announcement. Later, during a questioning by Egypt's Parliament regarding the reason behind moving the pulpits from their current places, Antiquities Minister Khaled El-Anani said that not all of the pulpits will be moved, and that each and every one will be studied as a separate case before deciding whether or not to move to the museum. Some of Egypt's fine artists slammed the decision, saying that protecting the pulpits can't be through storing them in the museum. "We are destroying and erasing our identity and the historic places,"artist Hamdy Sadek Abou Elmaati wrote on his Facebook page. Earlier in April, British Ambassador to Egypt John Casson announced launching the "Saving the Mamluk Sultanate-era pulpit" project. This was considered to be the first restoration project of historic Cairo mosques with British funding. The pulpits that are supposed to be restored, according to Casson, belong to the Bayt Al-Razzaz and Ibn Tulun mosques. In the same context, Abdul Ghani Hendi, a member of the Supreme Council for Islamic Affairs, stressed that belongings of ancient mosques will be moved in accordance with their size and shape as large ones will be left in mosques and the other small belongings will be moved. In this regard, he remarked that chandeliers of historic mosques and Islamic lamps will be transferred as they could be stolen or broken easily like those of Al-Refai Mosque, which will be presented in the Museum of Islamic Art. 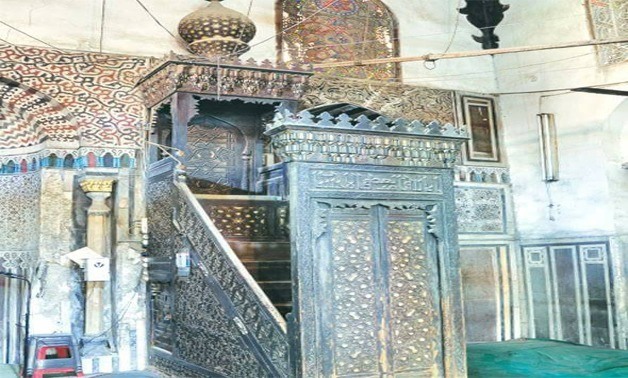 Regarding the large holdings, Hendi stressed that they would be left in the historic mosques to keep their ancient features without being used, referring that the three pulpits found in the Mosque of Amr Ibn Al-As will not be moved, but another alternative pulpit will be used during Friday speeches to protect the historic ones.